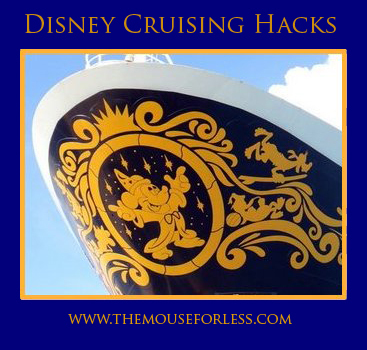 Planning for a Disney Cruise? Here are some tips I wish I had known before I cruised! Early PAT – When you check-in online, you can pick the time you will arrive at the port. Select the earliest port arrival time (PAT) you can, and arrive at the port at that time. This will help you skip long lines and get on board earlier. Your room will not be ready until approximately 1:30, and your luggage might not make it to your room until 5:30, so pack a bathing suit and cover up in your carry on. Grab some lunch at the buffet, and head to the pools! This is one of the best times to try out the water slides without long lines. 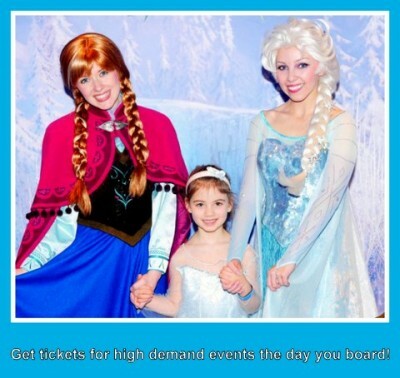 Ticketed Events – The cruise ships have recently started giving out tickets for high demand events, such as the Princess Gathering (you get to meet several princesses), Disney Junior characters, or meeting Anna and Elsa. The tickets are free, and you can pick them up once you board (typically at the Port Adventures Desk or Guest Services). There is no need to show up early for these ticketed events. Your ticket guarantees you a spot in line to see the characters at your appointed time. Baby Supplies – Disney Cruise Line has done everything they can to make travel with a baby convenient and stress free. They provide (upon request at no additional cost) a diaper genie, pack and play, bottle warmers, and even a stroller! (Note: Your room account will be charged for any supplies not returned at the end of the cruise). If you call DCL before you depart, they will have the supplies you request in your room when you arrive. High chairs are available in all of the restaurants. The dining crew is wonderful also – they asked us each night what type of food we would like pureed for the next evening, and it was ready for us almost immediately once we sat down so that the tiniest tummies didn’t have to wait. They will cook and puree any fruit or vegetable that they have on board. Key to the World – Each person in your room will have his/her own Key to the World card. This card lives up to its name! It is your pass off of and onto the ship at ports of call, it is your room charge card (no need to worry about credit cards or money while onboard), it tracks all of your photography experiences, and it opens you state room door. Lights Out – The Dream and the Fantasy have taken measures towards energy conservation in the state rooms. In order to turn on the lights, tv, etc, you are advised to place your Key to the World card into the slot above the light switch right inside the door. We discovered that it did not actually have to be a KTTW card; any old hotel room card or gift card will do, which can be much more convenient. The best idea I saw was to take an old gift card that you are no longer using and glue a thin magnetic strip across the vertical edge. When you are leaving the room, take it out and stick it to the magnetic door. When you return, it is waiting there to turn on your lights. Lanyards – Castaway Club members are provided a new lanyard each time they cruise to hold the Key to the World Card. First time cruisers may wish to pick up a lanyard with clear card holder before you travel or once on board the ship. They are extremely handy! Note: Keep only one KTTW card in your lanyard. It will not open doors or scan when several are stacked together. I ended up keeping the cards for my children in the room safe unless we were getting off the ship. Dining – The dining staff is fantastic, and they will do just about anything to keep you happy. The same wait staff travels with you through your dining room rotation. They quickly learn what you like and have things ready when you arrive. When ordering from the dinner menu, keep in mind that the sky is the limit! Kids can order from the adult menu. (Which I would recommend, as the “kids” selections are rather limited; my 6 year old only ordered from the kids menu one time on our 7 night cruise. 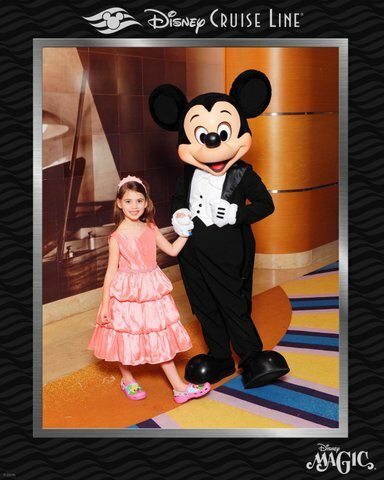 Editor’s Note: Disney just announced that they are now offering Mickey Check kids meals onboard their ships, so this may allow for a few more unique selections for kids going forward…though if your child does want to order off the adult menu, they are more than able to do so.) You can also choose to skip the appetizer and order 2 dinners, or order 3 appetizers instead of a dinner, or order 2 desserts. You can even order things that aren’t listed on the menu. If they have it on the ship, they will get it for you. Formal night – You are charged for alcohol and specialty drinks on board. The exception to this is on formal night, when you will see waiters walking around the main lobby area with trays of drinks at no extra cost. If you do not wish to have alcohol, the fruit punch is delicious! Photos – There are professional photographers on all of the ships. If you purchase a CD and/or photo package before you cruise, you can save 15%. The photographers are available to take your picture with characters, with professional backdrops, and on Castaway Cay. Snack Attack – Each ship has a quick service snack bar near the pool area that serves lighter fare (fruit, wraps) and chocolate chip cookies. There is also a self-serve ice cream station nearby. On our most recent cruise, my daughter suggested we combine the two and make chocolate chip cookie ice cream sandwiches. The ice cream flavor of the day was pineapple, which she insisted on putting on her sandwich. I thought it sounded disgusting, but since it was her evil plan I went along with it. It was delicious!! (But if you also think the pineapple sounds gross, they always have chocolate or vanilla). Mickey Bars & Coffee – If you don’t get enough ice cream from the self-serve station by the pool deck, you can always order room service. We like ordering Mickey ice cream bars and a carafe of coffee before bed. The coffee stays hot in the carafe until morning so we can have our morning cup without leaving the room or having room service knock on the door and wake the kiddos. Also, if you find yourself becoming a Mickey Bar addict like me, you can order one at dinner for dessert. They put fun Mickey sprinkles on them in the dining room. Pack Less – I wore very few casual clothes on my 7 night cruise. I wore a bathing suit and cover up each day, and whatever the appropriate attire was for dining at night. If you plan on taking advantage of the pools, leave the extra casual clothes at home. Cruising with Disney Cruise Line can be exceptionally fun and these tips are just a few ways to enjoy a swimmingly wonderful time. Do you have any great tips you wish you had known before you cruised?